Welcome Paranaque PaoHong Wushu Students, Parents and Friends! In 1994, PaoHong Wushu started out as a club in the University of the Philippines—Diliman, Quezon City and became one of the first Filipino organizations to be affiliated with Wushu Federation Philippines (WFP). 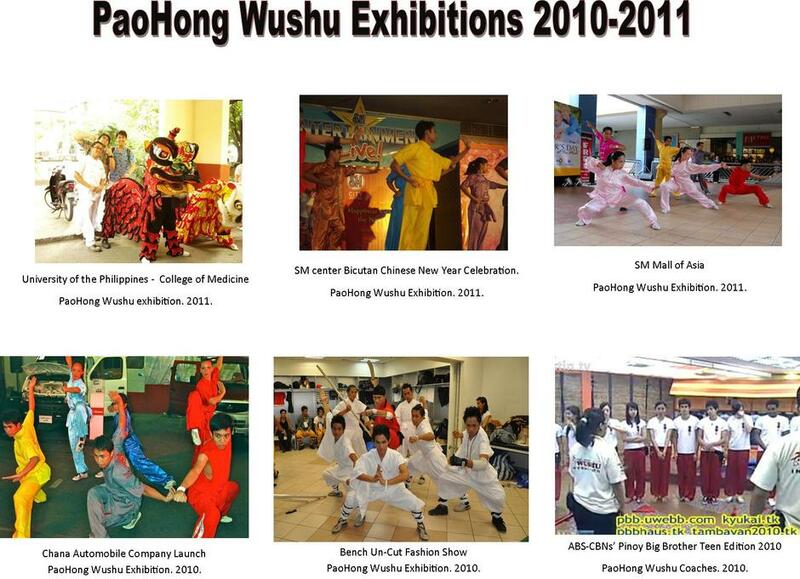 Year 2009, the group decided to open a wushu training gym at BF Homes, Paranaque City to further share their passion for the sport of wushu. Paranaque PaoHong Wushu Team is a group of passionate Wushu enthusiasts whose main objective is to promote the sport of wushu to a wide range of social groups but focuses mainly on the enrichment of the underserved youth in the Philippines thru sharing their knowledge and skills to its students. 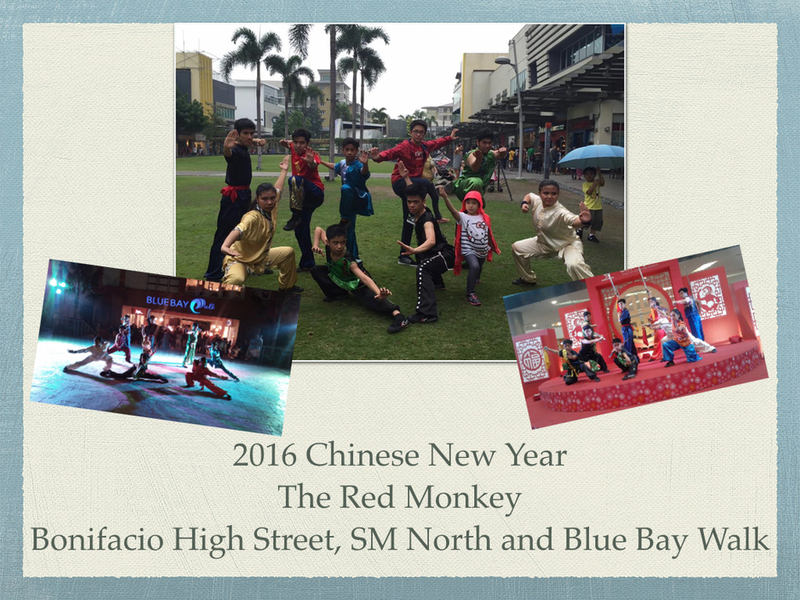 Year 2016 - For the Year of the Red Monkey, Paranaque PaoHong Wushu Team performed again, but this time for 2 days, for the Bonifacio High Street in Bonifacio Global City, and at SM North, Quezon City. And also, for the first time at Blue Bay Walk, Pasay City. 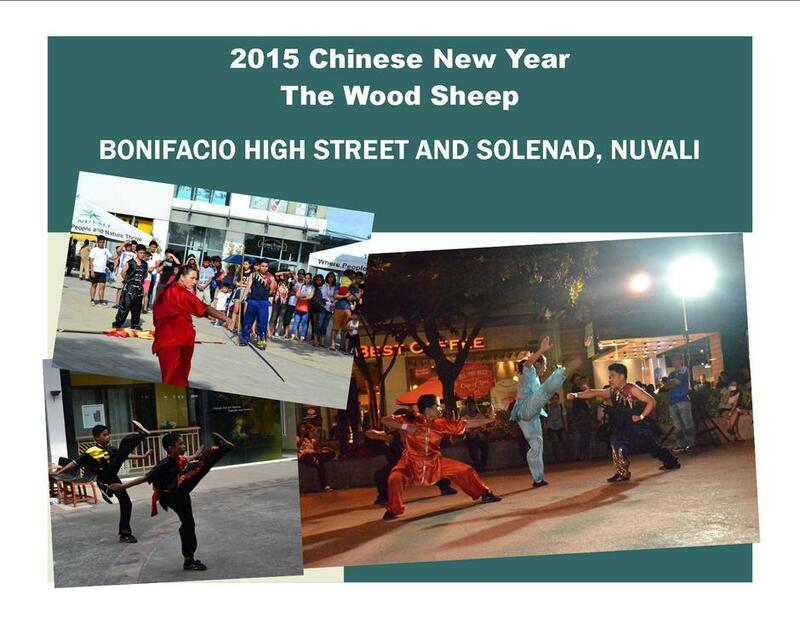 Year 2015 - For the Year of the Wood Sheep, Paranaque PaoHong Wushu Team perfomed again for the Bonifacio High Street in Bonifacio Global City and for the first time at Solenad, Nuvali. 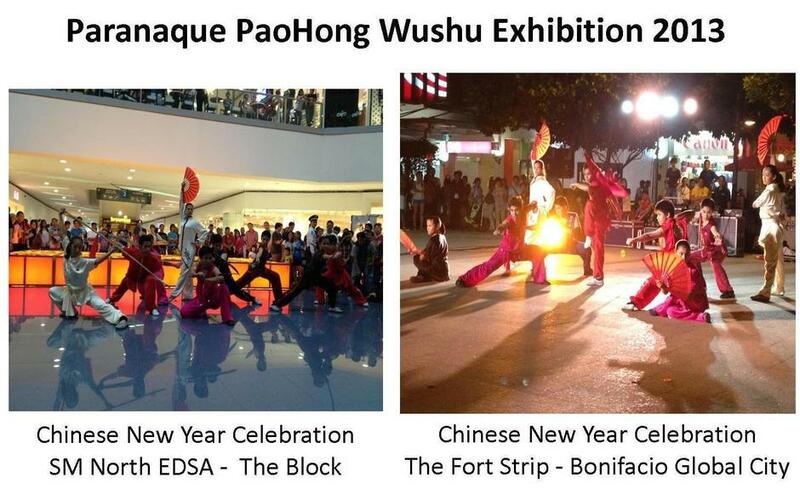 Year 2014 - For the year of the Wooded Horse, Paranaque PaoHong Wushu Team performed again for The PartyLinks at SM Fairview this time and again at Bonifacio HighStreet in Bonifacio Global City. Year 2013 - For the year of the Snake, Paranaque PaoHong Wushu Team performed for The PartyLinks at SM North EDSA and again at HighStreet in Bonifacio Global City. 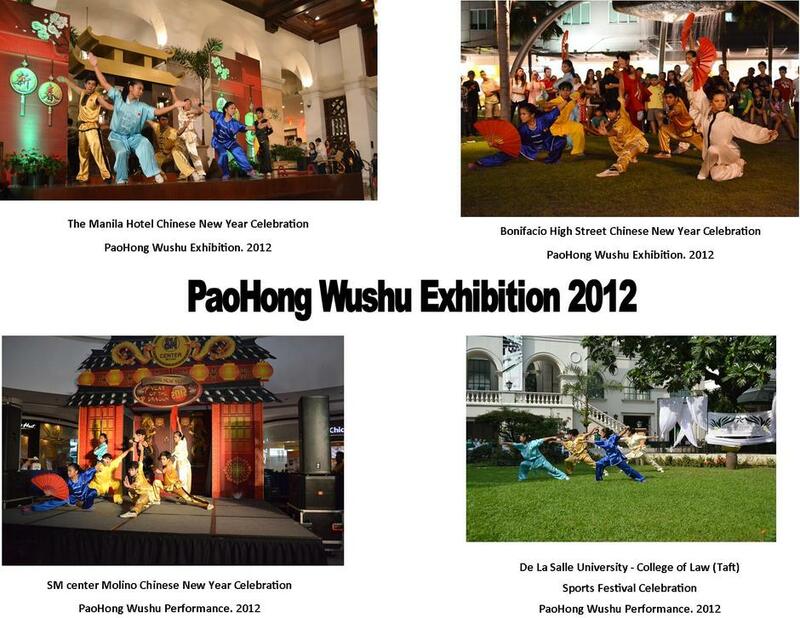 Year 2012- For the year of the water dragon, the team have been requested to perform for SM supercenter Molino, De La Salle University - College of Law(Taft), The Manila Hotel and at the Bonifacio High Street(Bonifacio Global City). Year 2011- We performed for Chana(Cherry) Automobile for their company/product launched at the 3rd Philippine International Motor Show held at the Philippine World Trade Center. Our team also performed for SM center Bicutan, SM Mall of Asia and University of the Philippines - College of Medicine as part of their celebration of the 2011 Chinese New Year. Year 2010 - Paranaque PaoHong Wushu Have become well known for our skillful and talented coaches who visited ABS-CBNs’ most watched program Pinoy Big Brother Teen Edition 2010 and another wushu exhibition for Bench Un-Cut 2010. Year 2000-2004 - We have been invited to perform Lion Dances to various places like SM supermalls and well known hotels like the Waterfront Hotel in Cebu City. 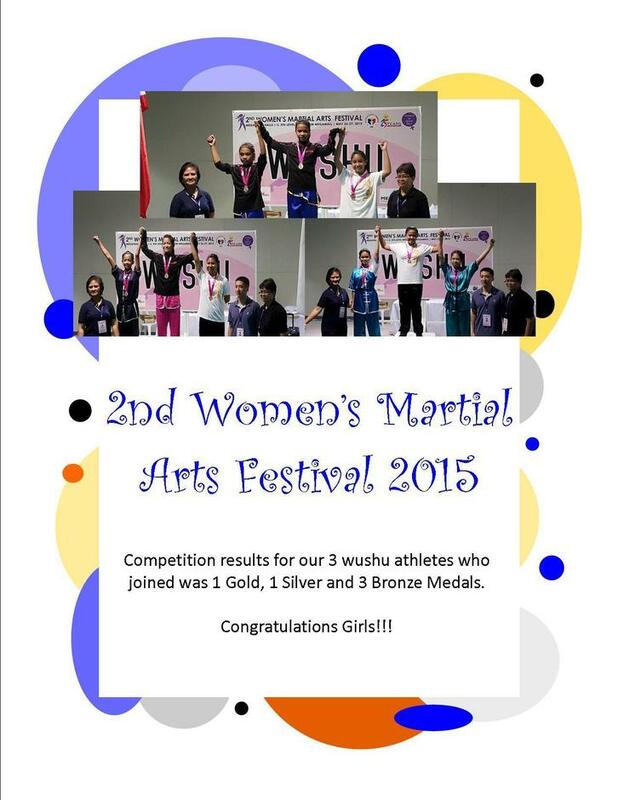 2015 Women's Martial Arts Festival that was held in Manila. 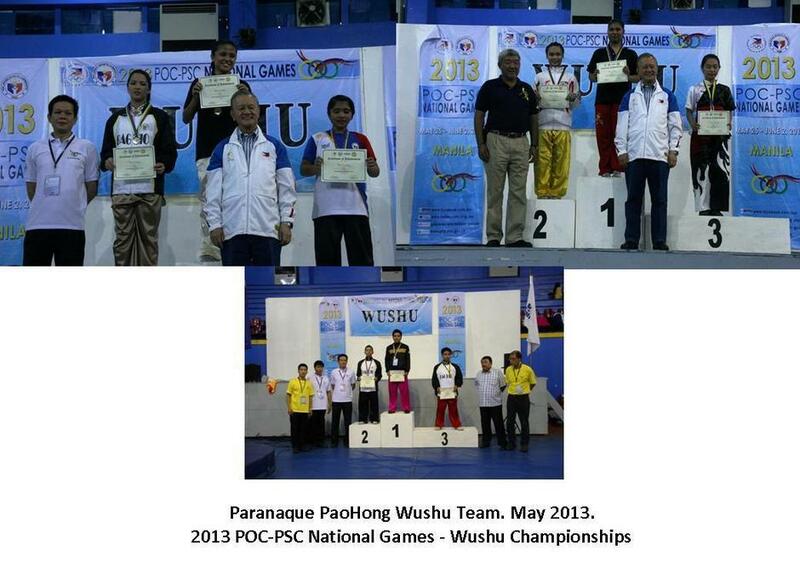 Paranaque PaoHong Wushu Team brought home 1 Gold Medal, 1 Silver Medal and 3 Bronze Medals on the said event. Paranaque PaoHong Wushu Team (that comprises of just 5 student-athletes) joined for the 4th time in the 2014 POC-PSC NATIONAL GAMES - WUSHU CHAMPIONSHIP that was held in Manila. 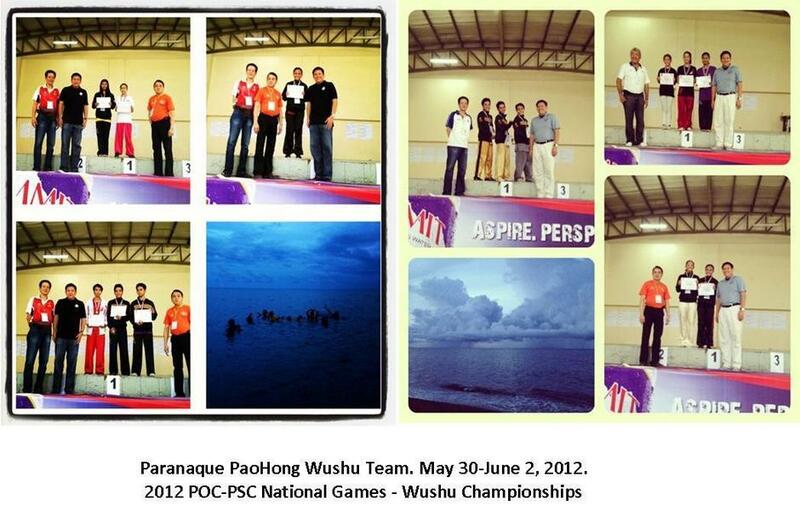 Paranaque PaoHong Wushu Team brought home 6 Gold Medals, 4 Silver Medals and 2 Bronze Medal on the said event. Paranaque PaoHong Wushu Female Team Members (that comprises of just 3 student-athletes because it is a school season) joined for the 1st time in the 2014 ALL WOMEN's MARTIAL ARTS WUSHU CHAMPIONSHIP that was held in Manila. Paranaque PaoHong Wushu Female Team Member's brought home 3 Gold Medals, 2 Silver Medals and 1 Bronze Medal at the said event. 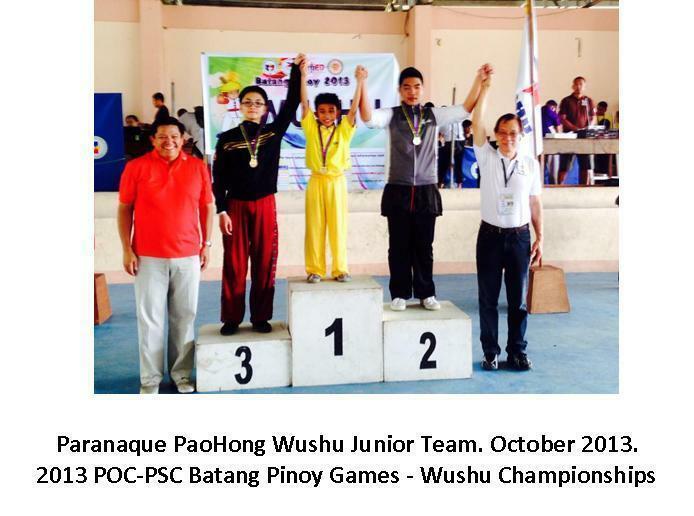 Paranaque PaoHong Wushu Junior Team (that comprises of just 2 student-athletes because it is a school season) joined for the 2nd time in the POC-PSC Batang Pinoy Games—Wushu Championships that was held in Iba, Zambales on October 2013. Paranaque PaoHong Wushu Junior Team brought home 1 Gold Medal and 1 Bronze Medal at the said event. Paranaque PaoHong Wushu Team joined for the 3nd time in the POC-PSC National Wushu Championships 2013 that was held at Manila City on May. Paranaque PaoHong Wushu Team brought home 6 Gold medals, 2 Silver medals and 1 Bronze medals at the said event. 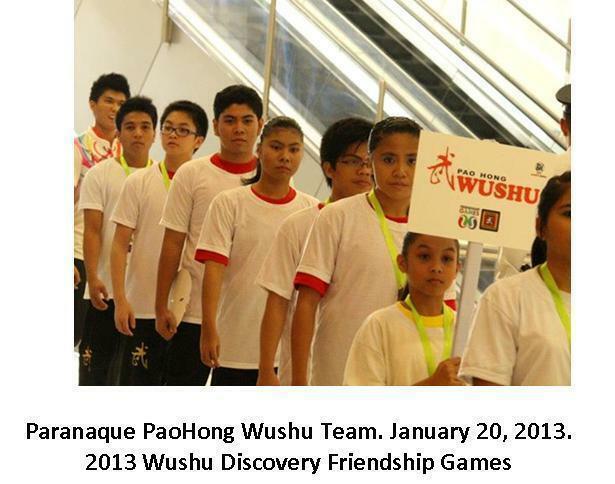 Paranaque PaoHong Wushu Team joined the Wushu Discovery Friendship Games 2013 that was held in SM North EDSA on January 20th. Paranaque PaoHong Wushu Team Won 4 Gold Medals, 5 Silver Medals and 3 Bronze Medals on the said event. Paranaque PaoHong Wushu Team joined for the 2nd time in the 2012 POC-PSC NATIONAL Games - Wushu Championships that was held in Dumaguete City on May 30-June 2. The Team won 6 Gold medals, 5 Silver medals and 6 Bronze medals. 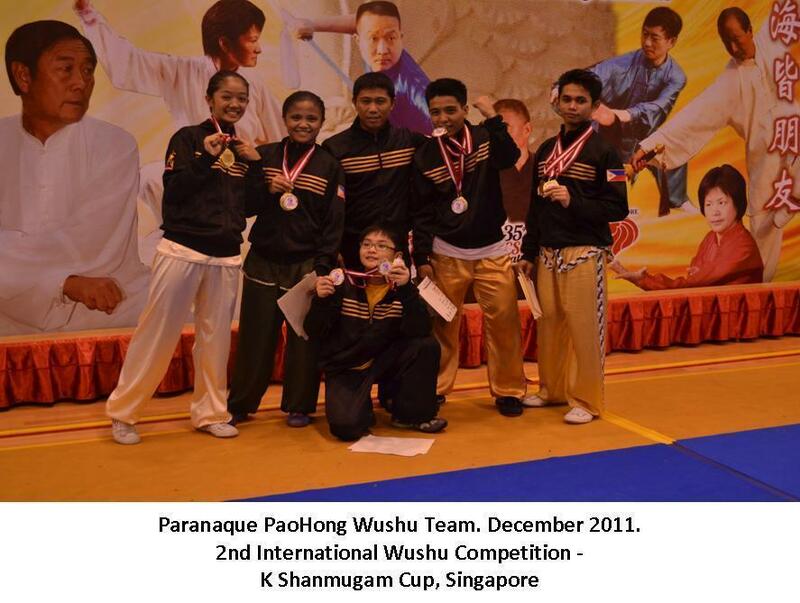 Paranaque PaoHong Wushu Team accepted the invitation of Singapore through Wushu Federation Philippines (WFP) to compete at the 2nd International Wushu Competition - K Shanmugam Cup in Singapore last December 9-10, 2011. The Team brought home 13 Gold medals and 1 Silver medal at the said international competition. 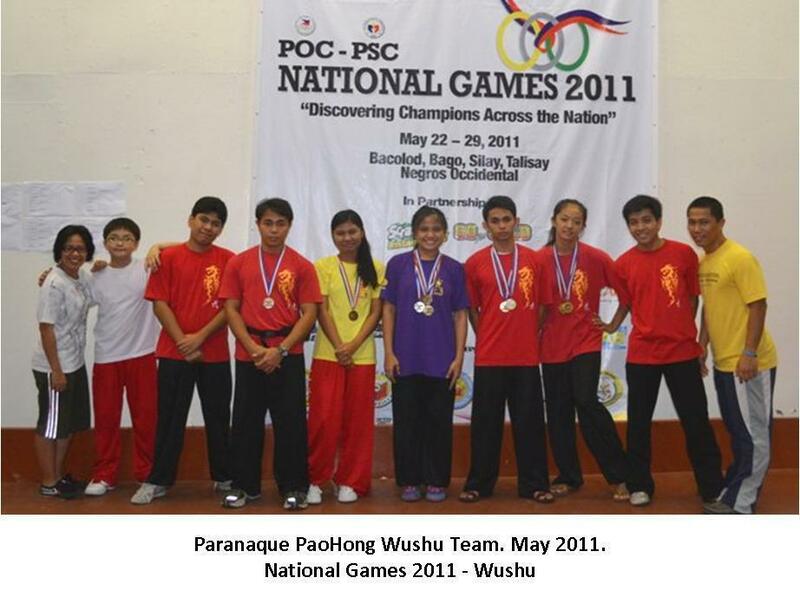 Paranaque PaoHong Wushu Team joined for the 1st time in the 2011 POC-PSC National Games - Wushu Championship that was held in Bacolod City on May. The Team won 3 Gold medals, 3 Silver medals and 3 Bronze medals at the said event. Deep breathing: Find a quiet place to sit down and inhale slowly through the nose, drawing air deep into the lungs. Hold the breath there for about 5 seconds, then release it slowly. Repeat the exercise five times. Visualization: Eyes closed, picture a peaceful place or event. While recalling the beautiful sights and happy sounds, imagine stress flowing away from the body. Or visualize success. People who advise competitive players often recommend that they imagine themselves completing a pass, making a shot, or scoring a goal over and over. On game day, recalling those stored images can help calm nerves and boost self-confidence. Mindfulness: Focus on the present instead of worrying about the future, and stop negative thinking by focusing on the positives. Whether preparing for a competition or coping with a defeat, repeat positive affirmations: "I learn from my mistakes!" "I'm in control of my feelings!" "I can make this goal!" Do a body good. It's important to eat well and get a good night's sleep, especially before games where the pressure's on. Do something fun. Encourage your child to engage in some type of activity other than the sport he or she is involved in. Suggest taking a walk, riding a bike, seeing a movie, or hanging with friends to get completely away from the sport that's causing stress. Avoid perfectionist thinking. Don't try to be perfect — and don't expect it in teammates either. Everyone flubs a shot or messes up from time to time. Teach your child to forgive himself or herself and move on. It's possible that some anxiety stems only from uncertainty. Encourage your child to meet privately with the coach or instructor and ask for clarification if expectations seem vague or inconsistent. Most instructors do a good job of fostering athletes' physical and mental development, but some might need to work on it. And sometimes kids might need to be the ones to open the lines of communication. A child who is so nervous that he or she feels physically unwell before a game or begins to have trouble sleeping at night or concentrating at school may be over-stressed. This can lead to health problems, so it's important to discuss it and find ways to help. Simply sharing these feelings can ease anxiety. When talking, let your child know that you won't pass judgment or look down on him or her for revealing these feelings. Sometimes kids don't want to play a sport but don't know how to tell their parents. So ask if your child really wants to play or is just doing it to please you or someone else. Remember, while things like college scholarships are a nice reward for hard work, they may not be worth the risk of physical injury or long-term stress on kids. If your child wants to continue playing, perhaps a hectic schedule is part of the problem. Many kids are involved in so many teams and activities that there's no time left over for schoolwork, hobbies, or just kicking back with friends. Exhaustion can sap enthusiasm, even for a sport a child seems to love. If a too-full plate is the problem, discuss the options together. Perhaps it's time to let a sport go or to choose one that's less demanding. When looking for something new, encourage your child to try a variety of activities and choose the one that is the most enjoyable. Once a decision is made, respect it and give your child credit for recognizing the need to steer out of a stressful situation. This is a sign of courage, wisdom, and maturity. Sports are about enhancing self-esteem, building social skills, and developing a sense of community. And above all, whether kids play on the varsity team or at a weekend pick-up game, the point is to have fun. By keeping that as the priority, you can help your child learn to ride the highs and lows that are a natural part of competition. It has become very apparent that training in Kung Fu - Wushu has numerous health benefits. The hand styles are good for younger students and increases their fitness while enabling them to perform a range of routines. Kung Fu - Wushu has always had very strong links with Traditional Chinese Medicine (TCM): looking back through time the majority of old Masters were not only Kung Fu - Wushu experts, they were also the local herbalists, acupuncturists and bone-setters. As with the martial arts, this knowledge and skill was passed down through their families. Although anyone can train in Kung Fu - Wushu, it is essential to have realistic expectations, it just depends on what you are looking for in a class. To achieve a high level of skill will take time and dedication. If you are looking for just fitness or self defence then almost any style would be okay providing it is done with safety in mind. Fist and foot training are very important for coordinating the inside and outside activities. Inside activities refer to the mind, whereas outside activities refer to the bodily movements of the eye, hand and foot. The basic requirement of the body concerns posture and stance. When standing, the body should be erect and relaxed so that it can respond to an attack from any direction. The five body parts (head, two arms and two legs) should be well balanced in order to maintain coordination between the upper and lower limbs. The hand should coordinate with the foot, the shoulder with the hip, and the elbow with the knee. These are known as the three outside coordinations - Wai San He.Training in these fundamental techniques is the root of Northern Kung Fu. If you practice on a regular basis you will build strength, speed, agility and fluidity of movement. In the parks in China very early in the morning, you will find hundreds of people practicing Kung Fu - Wushu arts. Taijiquan has now become one of the most popular health exercises throughout the world. There is research being conducted to try and find out about the health benefits of Taijiquan, studies so far have shown that these kinds of exercise can help relieve stress, tension, bad circulation, high blood pressure, migraines, stiffness of the joint and back pain. Much of the knowledge and wisdom that has been collected over the years is being used by big research institutes in China, with doctors and scientists examining and experimenting on how Kung Fu - Wushu postures and movements can have such a dynamic effect on the body. The Chinese scientists/doctors found that they were good for increasing flexibility and stamina while helping to alleviate heart and lung conditions. It was also recognized as good for personal development and discipline in the younger generation. The internal arts like Taijiquan and Qigong are now more accessible to the older generation. In the olden times, the art of Wushu was established to teach a group of monks and soldiers strategic fighting forms in times of war. As time went on, it has developed into a full-contact sports and exhibition that has become highly functional and entertaining for many people. Students before were taught how to defend themselves with bare hands and with the use of implements. In martial arts school, teachers teach their soldier students to be healthy and conditioned in all aspects of their being. They were taught to gain good mentality as well as psychological and emotional stability. They learned the different techniques and approaches to relaxation and becoming disciplined. Nowadays, as children get older, they also need to learn the same characteristics in order to be strong and devoted like the early warriors. It is useful to have young children understand discipline and become obedient and respectful to others. The physical exercise and fitness development Wushu and other martial arts provides help them attain their maximum potential. Wushu classes offer kids the essential skills to become strong and determined while enjoying it. Each lesson in the wushu class aims to instill discipline and self-control to the students for them to be able to face every challenge calmly and positively. They build the confidence and necessary self-defence to safeguard themselves while the totality of their being is being molded as well - physically, spiritually and morally, mentally and psychologically. Wushu teaches the significance of teamwork and knowing how to abide by the orders when completing tasks. Young children will also be able to harness the power in the art of Wushu with the way it develops personalities and reflexes. They are still on the stage of growth and development, so constant learning is essential to build their physical and mental attributes. Children wushu lessons would help them enhance their movement and motor abilities, as well as their hand and eye coordination. Since children's bones and muscles are still developing, it is a good time to tone these up by giving them a better sense of balance and good posture. They also get to study through regular drills and other actions with other students. Friendly competition and sparring help the students up their skills and drive to win. Instructors know the value of motivating their students to increase their focus and desire for more competence and excellence. Proper breathing and relaxing exercises are included with the course. Trainings include coaching and sparring which both give the children various fighting techniques and combat skills. The classes are closely supervised and no violence or misplaced aggression are encouraged. They will play and/or fight in a safe and friendly environment supervised by professionals. 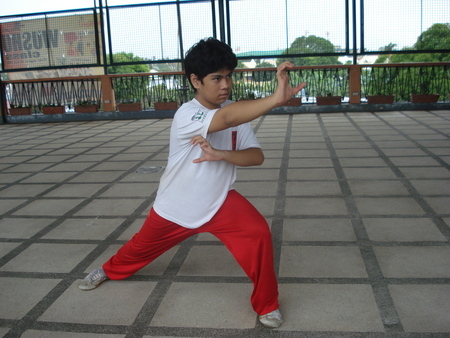 In general, enrolling Wushu classes for kids will benefit them in a myriad of ways. If you have an overactive child, then there's more need to enlist him in martial arts classes so he could channel his energies in a productive manner. All these plus additional concentration and mastery of self. 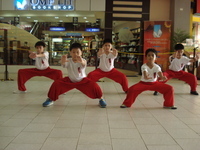 Hence, Wushu offers a number of advantages for your kids. This is the start to develop children's innate talents and skills which are further improved by working with the right people. Pao Hong Wushu Students in Training. 2010. The Pergola Mall. The sport of wushu is both an exhibition and a full-contact sport derived from traditional Chinese martial arts. It was created in the People's Republic of China after 1949, in an attempt to nationalize the practice of traditional Chinese martial arts. Most of the modern competition forms (套路 taolu) were formed from their parent arts by government-appointed committees. In contemporary times, wushu has become an international sport through the International Wushu Federation (IWUF), which holds the World Wushu Championships every two years; the first World Championships were held in 1991 in Beijing and won by Yuan Wen Qing. Competitive wushu is composed of two disciplines: taolu (套路; forms) and sanda (散打; sparring). Taolu involve martial art patterns and maneuvers for which competitors are judged and given points according to specific rules. The forms comprise basic movements (stances, kicks, punches, balances, jumps, sweeps and throws) based on aggregate categories traditional Chinese martial art style and can be changed for competitions to highlight one's strengths. Competitive forms have time limits that can range from 1 minute, 20 seconds for some external styles to over five minutes for internal styles. Modern wushu competitors are increasingly training in aerial techniques such as 540 and 720 degree jumps and kicks to add more difficulty and style to their forms. Sanda (sometimes called sanshou or Lei Tai) is a modern fighting method and sport influenced by traditional Chinese boxing, Chinese wrestling methods called Shuai Chiao and other Chinese grappling techniques such as Qin Na. It has all the combat aspects of wushu. Sanda appears much like kickboxing or Muay Thai, but includes many more grappling techniques. Sanda fighting competitions are often held alongside taolu or form competitions.